Zips forward Demetrius Treadwell scored a game-high 24 points in Akron's win over Oregon State. 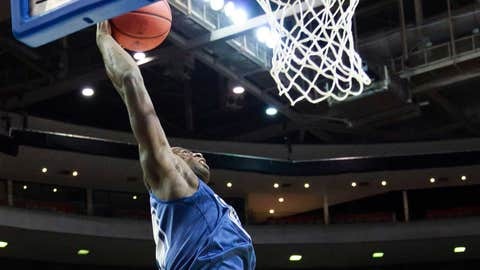 HONOLULU (AP) — Demetrius Treadwell scored 16 of his game-high 24 points in the first half and Nyles Evans added 17 points — including five 3-pointers — and Akron beat Oregon State 83-71 in a first-round game of the Diamond Head Classic Sunday. The Zips (6-2) shot 44.8 percent from the field and 38.5 (10 of 26) behind the arc to pick up their sixth straight win. They have now won 28 of their last 33 games dating back to last season. The Beavers (6-3), who entered the game ranked second (53.7 percent) in the nation in field goal percentage, shot 43.5 percent for the game to see their three-game win streak snapped. Akron built a 10-0 lead to open the game and led by as many as 16-2 early on after back-to-back 3-pointers by Evans. Oregon State closed out the first half on a 15-9 run, capped by Roberto Nelson’s buzzer-beating trey, to pull within 35-34 at halftime. Cheikh N’diaye’s outback with 7:02 to play cut the Zips’ lead to 56-53, but Reggie McAdams answered with a 3-pointer from the left corner to help Akron regain a six-point lead. The Zips made 13 of their 14 free throws in the final 2:31 and were 21 of 29 for the game. Treadwell was 10 of 13 from the line and grabbed 10 rebounds. Quincy Diggs finished with 11 points and was 7 of 9 on free throws. Akron got 16 points off of 10 Oregon State turnovers and 15 second-chance points. The Zips will play No. 17 Iowa State in a semifinal Monday, while the Beavers will meet George Mason in a consolation game. Roberto Nelson led the Beavers with 20 points and Devon Colliers added 10. To make matters worse for Oregon State, fifth-year senior center Angus Brandt, who scored 27 points in a win over Towson Wednesday, suffered an apparent right knee injury less than a minute into the second half. Brandt tore the ACL in the same knee early last season. 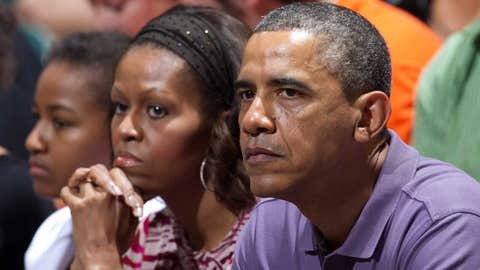 President Barack Obama and the first family were among the 8,694 fans in attendance. Oregon State coach Craig Robinson is the brother of first lady Michelle Obama. The Beavers took their first loss with Obama in attendance after winning all four previous contests he took in, including a win at Maryland last month.